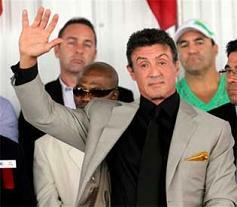 Sylvester “Rocky” Stallone elected into the Boxing Hall of Fame: “Absolutely”! I've been reading about some of the controversy surrounding actor Sylvester Stallone’s induction into the International Boxing Hall of Fame. Happily, the comments have been limited to boxing forums and a few other places. First off, I get it. Stallone was not a professional boxer. He never trained anybody. His association with boxing has been through the movies. Yep I know, yada, yada, yada. Maybe it’s an age thing, but it seems many have forgotten about the impact the first “Rocky” had on the movie going public. The film cost around a million dollars to produce. Stallone, a struggling actor, worked for almost nothing. Talia Shire, unforgettable as Adrian, had to provide most of her own costume. Burt Young liked Stallone, while Carl Weathers (as Apollo Creed) blew everybody away at his audition. Weathers asked who the person with the long hair and the glasses was. That’s the writer he was told, he’s playing Rocky. That longhaired person with glasses had written the screenplay in less then three days, living off caffeine and ambition. A few days before he had witnessed the Muhammad Ali/Chuck Wepner fight and something had clicked. MGM Studios wanted his screenplay but not him. They offered the unemployed actor two hundred thousand dollars, to NOT play the lead. Stallone held to his guns. I had heard about this film called “Rocky” from a high school friend. He was raving that I had to see it, that ‘something happens’. Having been a boxing fan all my young life, and a lover of boxing movies, I was curious. We went on a Friday night and I can remember being bored at the beginning. Then like magic, things began to happen. Rocky gets together with Adrian, and in one of the most dramatic scenes in the film, goes head to head with grouchy trainer Mickey (Burgess Meredith). As Rocky began to train I could feel the people around me stirring. The final act was the fight, and somehow it now felt real. As the film rushed to its conclusion, I, too, heard myself screaming and yelling at the screen. A little film with a character named “Rocky” had touched a nerve. The acting by the entire cast had been phenomenal. Even the music led by “Gonna Fly Now” was perfect. The film picked-up Academy Awards for Best Director (John G. Aviidsen) and Best Film. Stallone was nominated but lost. Nevertheless, the ultimate victory had been his and his alone. At the election ceremony, he said, “I never tried to be a boxer or pretend I was a boxer. But I was inspired by these guys up here because they bare their souls to the world when they’re in the ring”. Did Stallone’s movie promote boxing; did it help make the sport more popular internationally? Of course, it did, and for that alone, Sylvester Stallone deserves a place in Canastota.